The Chain-of-Responsibility design pattern is a rather obscure behavioral pattern that is useful for creating workflows within a solution. Despite its obscurity, it happens to be one of my favorite all-time design patterns. The pattern chains the concrete handling classes together through a common chaining mechanism (some architects and developers also refer to this as the command class), passing a common request payload to each class through a succession pipeline until it reaches a class that is able to act upon the request. I have personally and successfully architected a solution using this design pattern for a large and well-branded U.S. retail company. The solution is responsible for printing sale signs in well over a thousand stores across the United States, saving my client approximately $10 million dollars a year, year-over-year. From a development perspective, leveraging this design pattern made it easy to isolate the various units of the workflow, simplifying the process of assigning my various team members to the discrete pieces of functionality that were exposed as a result of using this behavioral design pattern. While I am unable to discuss anything further about my previous personal experiences with this client, I am able to demonstrate a working example of this design pattern and focus on a business problem that is completely unrelated to anything I’ve done in the past. So, without further adieu, allow me introduce a fictitious business problem to you. The crates the engines are transported on are very durable and allow for the engines to be stacked on top of each other during transport, which means each truck will reach its maximum weight load well before it runs out of space. As pointed out above, specific engine types get shipped to specific locations. Occasionally engines are put in the wrong trucks, as loaders are very busy and are working strictly from memory. When this occurs, it’s a miserable experience for everyone. Sometimes the trucks aren’t filled to capacity, causing them to operate well below their maximum load. When this occurs, shipping and other operational costs skyrocket, causing us to lose money. The loading crew has been notified of these issues, but mistakes continue to be made. The larger distribution centers we ship to have stated that if the problem isn’t resolved soon, they will cancel our contract and look for a more reliable and efficient transport company. We need a solution that tells our loading crew what truck to load the engine on, as well as something that tells them whether or not the truck is filled to maximum capacity from a maximum weight load standpoint. The engine manufacturing company doesn’t plan to produce any other types of engines in the near future, but there is a possibility they may want to have more than one type of engine distributed to each of the three distribution points. There are no firm arrangements for this to happen yet, but the solution that is put into place must take this into account. Because we know the dimensions of each truck’s cargo hold, as well as the weight and dimensions of each product being shipped, the solution should be architected to allow a handler to determine the best course of action for the request it is handling. This is similar to the shipping company allowing the handlers of the crates to determine which trucks the different products should be loaded into. However, instead of allowing a single entity to make this type of determination, we’ll decouple this association and allow the decision pattern to pass through a chain of inspecting classes, forcing the responsibility of determining whether or not it is capable of handling the request onto the class itself. If the class determines it cannot handle the request, then it will pass the request onto the next handler, who will then decide whether or not it is able to handle the request. This process will continue until we’ve exhausted every available concrete handling class. By architecting the solution in this manner, we’re fairly sure that we’ll be able to meet all of the functional requirements articulated to us by our client. Given the previous requirements, one great pattern that allows an object to pass along a chain of handlers until a handler determines it is capable of handling the request is known as the “Chain of Responsibility Handler”, or the CoR Pattern. Unlike a Mediator/Observer patter, CoR doesn’t maintain a link between the handlers in the chain, which is why CoR stands out from other patterns, making the sender and the receiver completely decoupled and allowing each handler to maintain its own set of standards and separation of concerns, making it a true object oriented workflow pattern. Another great aspect beheld in this pattern is that there very little logic in the sender, beyond setting up the successive chain of concrete handlers. What’s more, the sender isn’t tasked with interrogating the request before making a request to handler. It merely chains the concrete handlers together and allows them figure out the rest, with each concrete handler being responsible for its own separate criteria and concern. i. Create an interface used to handle requests. ii. Sets the successor used to interact with the next concrete method. iii. Implements the successor link in the chain. Interrogates the request and determine whether or not it can act upon the information. If it can’t access the request, then it forwards the request to the next handler (aka the successor). The Sender Class can be a concrete class that acts autonomously of the client to establish the successive order of the ConcreteHandler classes and then acts upon them. We’ll start out with the creation of the handler class. As pointed out in the summary of the code and description in the previous section, the Handler Class is responsible for assigning the next successor concrete class in a chain of classes that we’ll set up in just as bit. Next, we’ll implement the concrete handlers, inherit from the handler class, as well as act upon the request message. Here is the concrete handler for the blue engines. Continuing the successor chain, we’ll now implement the concrete handler class for the yellow engines. If the previous concrete handler can’t handle the request, then the blue class will then be responsible for determining whether or not it can. As you can see, the pattern follows the exact same pattern as the blue engine concrete handler. The final concrete handler in the successor chain handles the workload for yellow engines. If neither the blue concrete handler nor the yellow concrete handler are able to act upon the contents of the request message, then it’s likely that the yellow concrete handler will be responsible for the work. If not, then it too falls through the chain and returns the same IEngine values that were passed into it, meaning no work was performed on the request message. The engine class is pretty straightforward. It implements the IEngine interface and provides us with a mechanism in which to store our payload data. Actually, I’m not very fond of including this in my example, because I believe that most of this can be inferred and it unnecessarily bloats the example. However, I’ve included it anyway just to be thorough. For purposes of simplicity, my solution doesn’t tie into a database, so I’m inferring all of my references by front loading the base IEngine types. In reality, you would be much better off storing these values in a data backing store of your choice (e.g. configuration, database, etc..). Basically, you just download it, or the latest version of it, and unpack it in a directory on your machine. Afterwards, you’ll be able to reference different assemblies to exact the specific actions you desire by referencing different assemblies (e.g. MVC, Service Locator, Dependency Injection, etc…) in the Unity download. Of course, you’ll still have to hand roll any patterns not provided by the Unity Library, but it will still offer you with a decent jump start in the areas that the library does specifically address. I want to decouple object dependencies from the main assembly to any client applications, which will allow me to minimize the amount of work necessary to replace or update certain properties to the IEngine and Engine classes without necessarily forcing me to make changes to methods that leverage these classes throughout the solution. I’m assuming that the client application that will eventually consume this assembly will need to know very little about its concrete implementation at compile time, so adding or subtracting certain properties to the interface and its support concrete type should pose little or no rework for the client applications. Even though I didn’t follow a TDD approach, I still might want to create unit tests that perform assertions on various parts of the code base in the future, so each class and method must be able to be tested against without using any dependencies. I want to decouple my classes from being responsible for locating and managing the lifetime of dependencies. 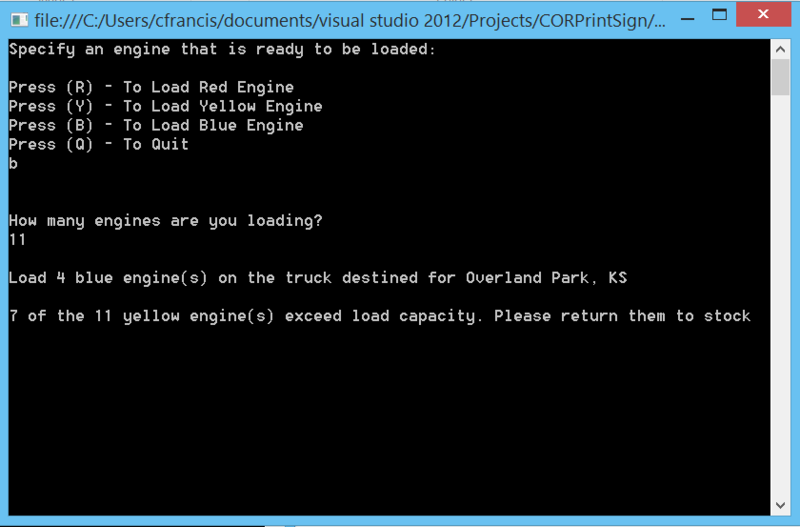 Next, drop in the following factory pattern to setup the ability to create an instance of the Engine object. Ideally, our client application will simply be able to call the CreateInstance method and pass the desired engineType to Register and Resolve the IoC Container for the object, as well as set a few base properties. We’ll achieve this using the Microsoft Unity Framework. This is what allows us to decouple our object dependencies from the main assembly to any client applications. The control of each object’s creation is inverted to the Factory inside the assembly, so the client needs to know very little about creating or consuming the object itself. The Microsoft Unity Framework takes care of all of this for you. 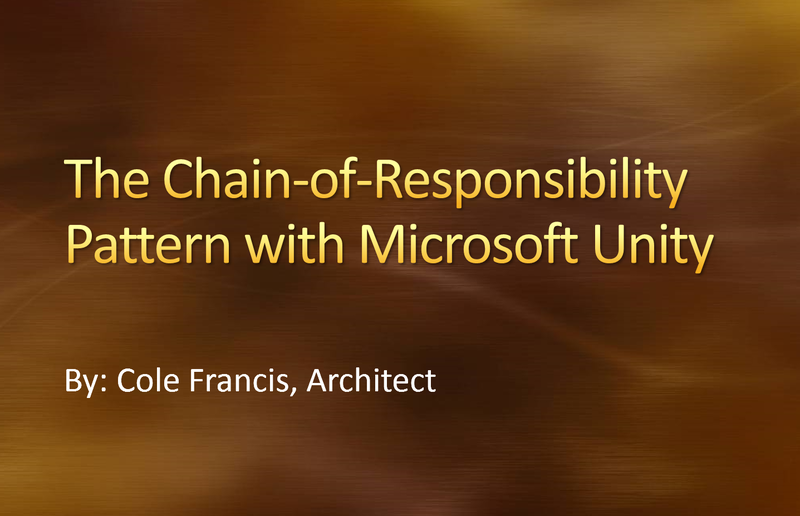 The next interesting piece involves closing the gap on the chain-of-responsibility pattern by implementing a definitive successor chain of responsibilities using the concrete handler types. The following lines of code designate that the ShipmentHandlerBlue() concrete handler will receive the initial payload request, and if it can’t handle it then it then it will be its responsibility to pass the request message along to the ShipmentHanlderYellow() concrete handler in the chain. Finally, if it can’t handle the payload request, then it will finally pass the responsibility down the chain to the ShipmentHandlerRead concrete handler for fulfillment. Each concrete handler acts autonomously in the chain, meaning that it doesn’t have to know anything else about any other concrete handler, enacting a true separation of concerns and a classic, textbook example of the chain-of-responsibility pattern itself.